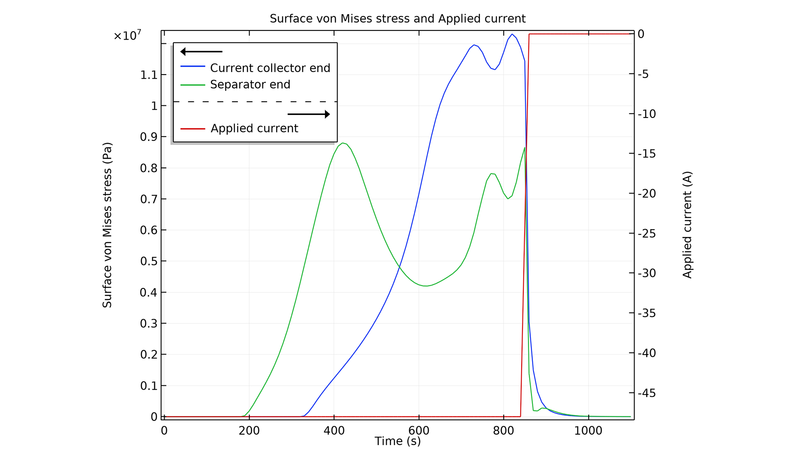 For users of the Batteries & Fuel Cells Module, COMSOL Multiphysics® version 5.4 includes a new Lumped Battery physics interface, stress and strain in electrode particles, and multiple ion transport in ion-exchange membranes. Read more about these battery and fuel cell features below. The new Lumped Battery interface is used to define a battery model based on a small set of lumped parameters, requiring no knowledge of the internal structure or design of the battery electrodes, or choice of materials. Models that are built with the Lumped Battery interface can typically be used to monitor the state-of-charge (SOC) and the voltage response of a battery during a load cycle. The interface defines a battery heat source that may be coupled to a heat transfer interface for modeling battery cooling and thermal management. The interface also includes the Capacity Fade feature. Voltage prediction made by the Lumped Battery interface during a dynamical load cycle. The new Stress and Strain section of the Particle Intercalation node in the Lithium-Ion Battery interface allows for simulating the resulting stresses and strains in electrode particles due to lithium intercalation. The particle stress is of particular interest in aging and capacity fade simulations, since the stress may result in particle cracking, which in turn may result in loss of active electrode material, or capacity fade due to accelerated solid-electrolyte interphase (SEI) formation. 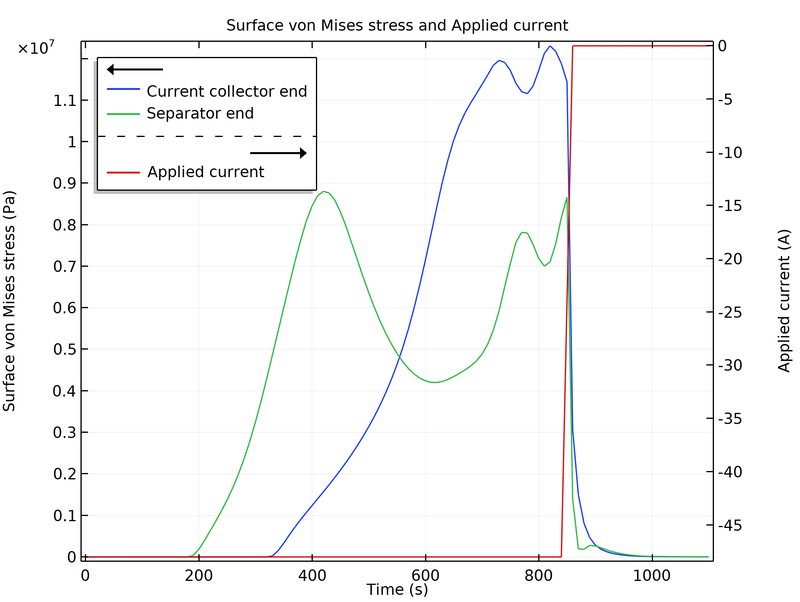 You can see this feature demonstrated in the new Diffusion-Induced Stress in a Lithium-Ion Battery tutorial model. Analysis of the resulting surface stress on the electrode particles in a lithium-ion battery during a constant load step followed by relaxation. Analysis of the resulting surface stress on the electrode particles in a lithium-ion battery during a constant load step followed by relaxation. Use the new Battery Equivalent Circuit entry in the Model Wizard to define a battery model based on an arbitrary number of electrical circuit elements. The Battery Equivalent Circuit adds an Electrical Circuit interface (now available with the Batteries & Fuel Cells Module) to the model, together with a number of predefined circuit elements; in particular, the new Battery Open Circuit Voltage circuit element, which adds a SOC-dependent voltage source. Additional circuit elements such as resistors, capacitors, and inductors may be added by the user. 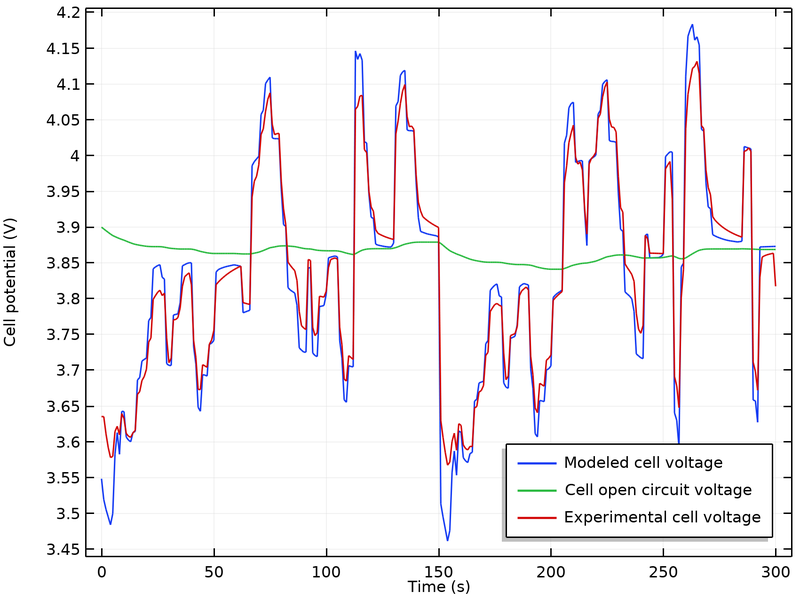 Models created with the Battery Equivalent Circuit feature can typically be used for coarse modeling of the SOC and voltage response of a battery during a load cycle. 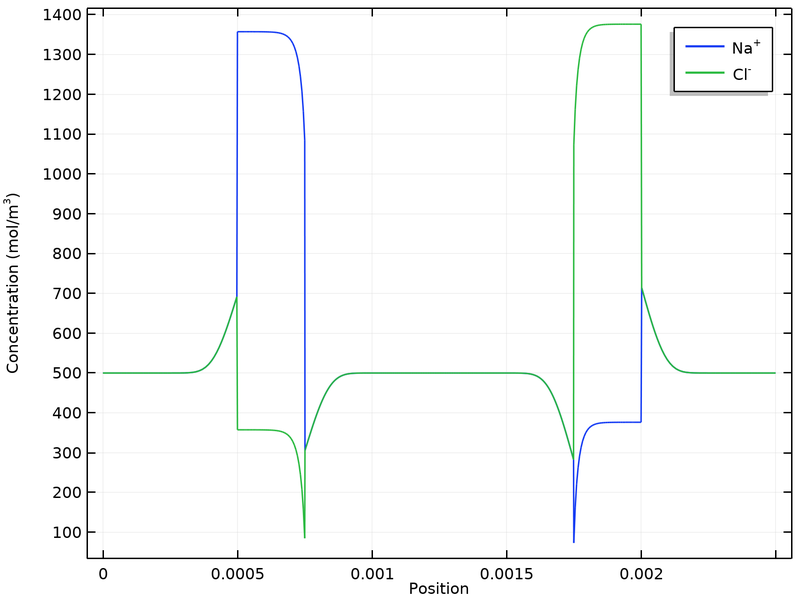 You can see this functionality used in the new Equivalent Circuit Model of a NiMH Battery tutorial model. The equivalent circuit used in the new NiMH battery tutorial. The equivalent circuit used in the new NiMH battery tutorial. The new Reuse sparsity pattern assembly setting has been enabled in the default solver sequence in the battery interfaces, and the default direct solver has been changed to PARDISO. The new settings typically shorten computation times by around 10%. The new Ion-Exchange Membrane domain node of the Tertiary Current Distribution interface automatically assigns a fixed and immobilized charge to a domain, and the corresponding Donnan boundary conditions to neighboring domains. The node supports ion transport of multiple ions in the ion-exchange domain, and multiple-ion Donnan boundary conditions. The Ion-Exchange Membrane Boundary node has also been updated to support multiple ion transport. This improvement offers extended capabilities for modeling electrodialysis and flow batteries. For more information, check out this corresponding blog post: How to Model Ion-Exchange Membranes and Donnan Potentials. You can see this feature used in the Vanadium Redox Flow Battery model. 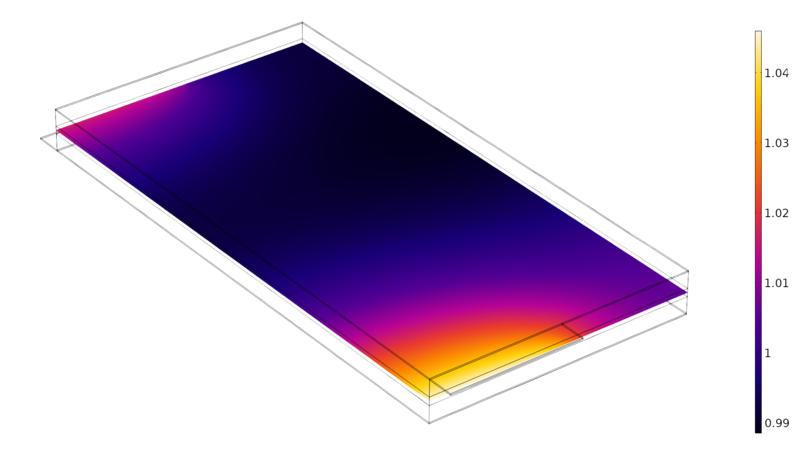 COMSOL Multiphysics® version 5.4 brings several new tutorial models. Relative cell utilization of a large-format pouch cell at the beginning of a discharge. 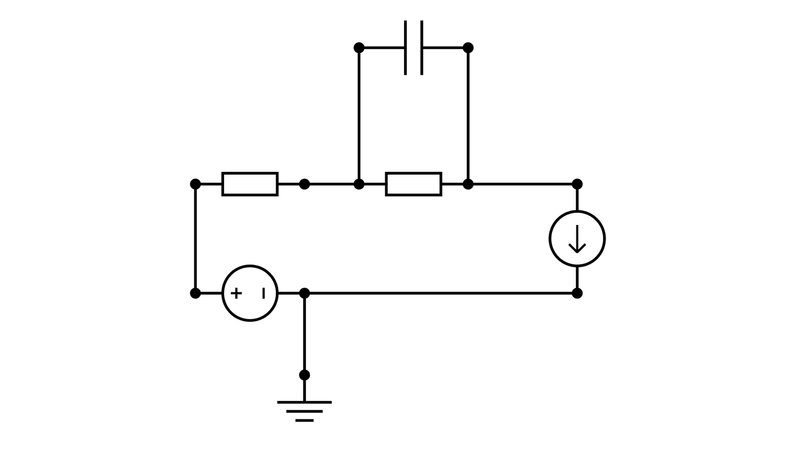 The equivalent circuit used in the new NiMH battery tutorial. Analysis of the resulting surface stress on the electrode particles in a lithium-ion battery during a constant load step followed by relaxation.